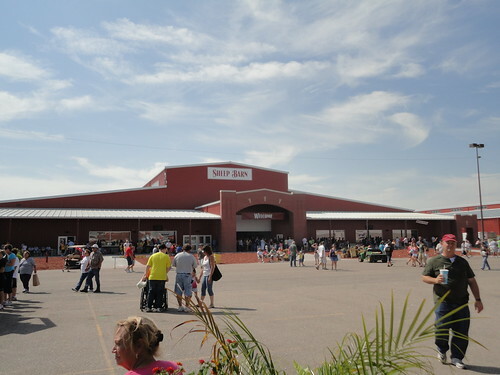 This year was the first year for the Nebraska State Fair to be held in Grand Island Nebraska. The State Fair had previously been held in Lincoln since 1901 and the move to Grand Island was quite the controversy here in the midwest. It was officially announced a little over a year ago that the fair was coming and ever since these huge red buildings (see above) have been popping up like weeds. The six buildings in total, were built just west of Fonner Park and the Heartland Event Center and we just happen to live two block from Fonner Park so we are literally within walking distance of the fair. We spent two separate afternoons at the fair and I must say everything was done quite well, especially considering they pulled all the construction equipment out the night before the start. The last weekend of the fair, Gillian’s brother, Colin, his wife, Katie, and kids, Colleen and PJ came to visit from New York. The kids loved the fair, with combine rides, pedal tractors, and copious farm animals. It was great to see everyone and get a glimpse at what is in Gillian’s and I’s future. This entry was posted on September 19, 2010 at 4:15 pm and is filed under Animals, Events, Midwest Life. You can follow any responses to this entry through the RSS 2.0 feed. You can leave a response, or trackback from your own site.